This year’s Christmas Eve recipe was slated to be Roast Lamb, a deviation from the family’s traditional Standing Rib Roast. Don’t get me wrong. I’m well aware a Standing Rib Roast shouts “Merry Christmas” louder than Santa on a float at the Macy’s Thanksgiving Day parade. This year, however, I yearned for a break from this ritual and serve up a roast leg of lamb. That plan was quickly scuttled as soon as my family got wind of my crazy scheme. I felt, uneasily, like I was in cahoots with the Grinch devising plans to invade Whoville. It was back to the traditional rib roast. I will, however, prepare it differently. 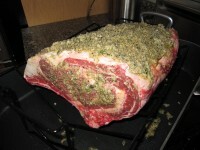 Making a standing rib roast can be as easy or as complex as time and confidence allow. In past years I’ve coated the roast with a purée of seasoned onion, carrot and celery before baking. One particularly time-starved year, I simply rubbed McCormick Montreal Steak Seasoning into the meat before roasting. On a more ambitious Christmas Eve, I enrobed the beef in a pastry crust before baking. No matter how simple or complex the recipe, there’s only one unanimous response emanating from the family at first bite: “Oh wow…This is soooooo good!” This year I’m modifying a Tyler Florence recipe that calls for baking the roast in a horseradish mixture. I’ve always loved horseradish and beef–this sounds like a slam-dunk to me. The very idea of making a Standing Rib Roast, with 3 or more ribs, can be an intimidating experience. It’s a huge piece of meat for starters. Secondly, it’s expensive. The trepidation of forking over 100-plus bucks for a piece of meat is not for the faint of heart. You really don’t want to mess this up. 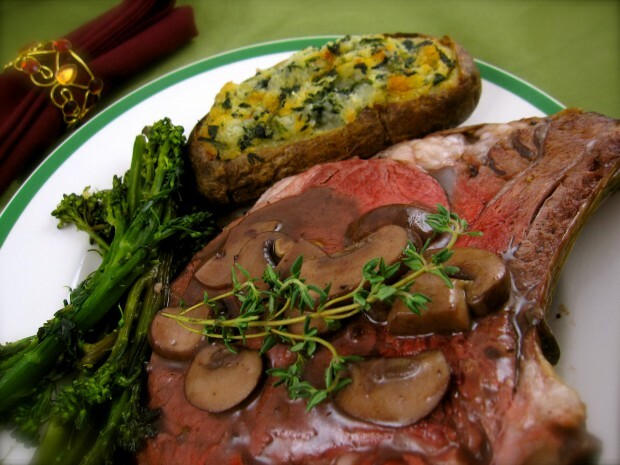 Your roasting time will vary according to the size of the beef; oven temperatures vary, as well. But as long as you are using a trusted meat thermometer, you’ll be fine. 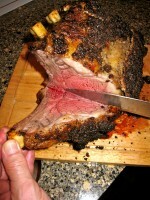 Many wonder if a standing rib roast is a prime rib roast. Yes, it is. It’s a prime rib with the bone attached, a “Standing Prime Rib Roast”, if you will. If I were serving a boneless prime rib, however, I would not refer to it as a standing rib roast. Jeremy Chavez, one of my favorite local butchers, tells me this is the one time of year Standing Rib Roasts fly out the door of Arbor Farms. This local grocery sells grass-fed, as well as grain-fed, beef. Their grass fed beef comes from the Manchester, Michigan family-owned “Lamb Farms”. Sparrow also sells Michigan-raised beef and recommends that after removing from your roast from the oven, put it on a cutting board, then tent it with foil for 30 minutes before carving. Resting time is the most important ingredient in this recipe. This allows the juices to flow back through the meat and tenderize it, improving its flavor. The mushroom gravy is not essential to the success of the recipe. The meat is simply delicious savored in it’s own juices, too. Like the Grinch, may our hearts grow three sizes this season. Merry Christmas! Make a paste by combining the garlic, horseradish, herbs, salt, pepper, and olive oil. Massage the paste over the entire roast. Allow the seasoned beef to come to room temperature 90 minutes prior to roasting. Lay the beef in a large, oiled roasting pan with the bone side down. Place the pan in the oven. Roast the beef until the internal temperature of the meat, inserted into the thickest part of the beef on an instant-read thermometer, registers 125˚ for medium rare, 2-3 hours. Remove roast from oven, tent with foil, and let rest for 30 minutes before carving. While the meat rests, strain and pour pan drippings into a medium-sized sauce pan. Over medium heat, sauté mushrooms in pan juices until just softened, 1-2 minutes. Remove mushrooms from pan and reserve. Add the wine to the pan juices and bring to a simmer until reduced by half. Whisk in the flour, then slowly add the broth, while whisking, and continue to cook, whisking until sauce thickens into a gravy, 10-15 minutes. For a richer flavor, melt butter in hot gravy, if desired. Return mushrooms to the gravy and serve with sliced roast, garnished with fresh herbs. *Use button or cremini mushrooms for a milder flavor; porcini or morels for an intense, unctuous flavor.